What Happens To An Aircraft’s Registration If The Corporation Or LLC Owner Is No Longer Qualified To Do Business? Fortunately, in most of those states the entity can be reactivated/reinstated, have the suspension removed, or be placed back in good standing by accomplishing the required filing (and usually paying an associated fee). But what happens to an aircraft’s registration if this happens to a business entity that holds title to that aircraft? Can the aircraft still be legally operated while the entity is “inactive” or “suspended”? According to a recent Legal Interpretation issued by the FAA’s Office of the Chief Counsel, the short answer is “no.” But to understand why the answer is “no”, it is helpful to look at the regulations that govern registration of an aircraft by a business entity. 14 C.F.R. §47.3(a)(3) permits a corporation (or a limited liability company, which is also treated as a legal entity similar to a corporation) that otherwise meets the U.S. citizenship requirements, to register an aircraft with the FAA. 14 C.F.R. §47.43(a)(3) tells us that an aircraft’s registration is invalid if, at the time of that registration, the business entity applicant was not qualified to submit an application under 14 C.F.R. Part 47. However, whether a business entity has “lost legal status” will depend upon the facts of the situation and also the applicable state law. As a result, the applicable state law must be analyzed to determine the business entity’s true legal status if it is in this situation. So, how does the FAA find out about an invalid registration? Well, since the FAA does not make determinations about the legal status of a business entity at the time of registration, or even while the aircraft is registered, this issue usually comes to light during an investigation or an enforcement action. And if the FAA learns the business entity has lost its legal status and that the aircraft’s registration is therefore invalid, it could pursue enforcement action against anyone who operated the aircraft when the registration was invalid in violation of Section 47.3(b). It could also pursue the business entity owner for failing to return an invalid or ineffective registration certificate as required by Section 47.43(b). The Moral of the Story: If you are going to use a corporation or limited liability company to own an aircraft, don't create the entity and forget it. Make sure you keep up with the required formalities and filings, including payment of fees etc., to ensure your business entity remains active and in good standing. Remember the old TV show called the A-Team? A rag-tag bunch of former soldiers travel around fighting criminals and righting wrongs. The A-Team was borderline psychopathic (especially their pilot), but they were always on the side of good. Regarding an aircraft acquisition, it takes your own A-Team: an Acquisition Team. You need to know these people and, if they are not within your organization, know where to find them! As the leader of this team, you are responsible for defining the mission. What is the key mission of the aircraft? What defines success for the aviation operation? Does everyone on your team know what this mission is? Most importantly, will the decision maker agree to the definition of this mission. This is used to define the minimum deliverable product in terms of capability and performance. The next team member is the technical analysis person. This person is responsible for developing the measurable criteria for judging the ability of the aircraft to perform its key mission. If you are the pilot, this will be you. That person should be familiar with aircraft performance measures, and have available information that enables them to predict passenger loads, trip lengths, etc. There may need to be runway analyses, equipment needs, and for helicopters, the vertical performance measures necessary for the operation. The technical person needs to be able to have the data needed for this comparison. This person will help to identify candidate aircraft and then to analyze the aircraft against the mission. Part of the technical analysis deals with maintenance requiorements. If purchasing a pre-owned aircraft, what may be required in terms of upcoming maintenance or upgrades? Where and who can do the pre-buy? If you have in-house maintenance, they are the best as they already know your operation. Costing and be able to look at the total cost of owning and operating the aircraft. If leasing, what are the return and buy-out options? Many leases have significant penalties for early returns, and most have specific return conditions that can add cost. Leases can be a great way to acquire an aircraft, but they aren’t for everyone. This person needs to understand the nature of operating costs and be able to communicate with the maintenance professionals regarding the costs of upcoming maintenance as well as then communicate and understand the costs as looked at by the Chief Financial Office or accountant. A close ally of the financial analysis person is the tax/ownership advisor. Tax planning should begin well before the purchase, not after the closing. Aircraft, by the nature of their mobility, may be exposed to taxes in multiple states. You need someone familiar with taxes as they apply to aviation. How do you plan to structure the ownership of the aircraft? Things to plan for are where and when will you take delivery? Are there sales or use taxes due and if so, who is responsible for collecting and remitting them? With the aviation tax person should be an aviation attorney. This person will need to be consulted to ensure that the contracts are appropriate and that the various regulatory issues are addressed. Are there leases, timeshare agreements, charter? A document that looks good from a basic business perspective may not be legal in the eyes of the FAA or other aviation authority. The FAA can be strict in enforcing the regulations regarding "for-hire" operators and you need to make sure that you are operating legally. Don't forget your insurance broker. They need to be kept informed as to what, when and how the aircraft is to be used. If you don't mention all the uses for the aircraft you may not be insured. What are your insurance company's requirements for the training and currency? Will it be different if you acquire a different aircraft? If the aircraft is to be on a management agreement, who and how are each of the parties to that agreement covered? Next is the aircraft sales professional. This individual needs to know the state of the aircraft sales market, what the availability and lead times are for various models, who to contact about pre-buy inspections and appraisals, and what sort of time it could take to dispose of your current aircraft. Anyone with Internet access can "find" aircraft for sale. The aircraft sales professional needs to act in an advisory role and as a facilitator to make sure the deal closes with all parties happy as a result. Lastly, don’t forget the a title search for used aircraft. They can also provide title insurance and provide the escrow entity for the closing as well as register the aircraft. The minor cost of this is well worth the piece of mind. If your are looking at large cabin jets, you may have requirements for crew rest, galley equipment, and internal baggage. If you have a cabin attendant, they need to be on the team. Same with the scheduler or dispatcher. Anyone with an interest in the successful outcome of the acquisition needs to be at least informed as to what is happening. Everyone has a different perspective and will see things that others may miss. Acquiring an aircraft should never be done in a hurry. There are many issues to cover and remember the PPPPPP rule! (Prior Planning Prevents Pitifully Poor Performance). Questions about the Business Aviation recovery still linger as there has not been much market movement to date. With most of 2017 behind us, however, we may be on the ‘cusp of change’. ‘For Sale’ inventories are down and aircraft transactions are up, while business jet prices remain weak. Real gross domestic product (GDP) increased at an annual rate of 3% percent in Q3 2017, according to the ‘advance’ estimate released by the Bureau of Economic Analysis. In Q2, real GDP increased 3.1%. This is welcome news because, as we have historically seen, when GDP is at the 3% growth mark (or higher) Business Aviation traditionally does well. 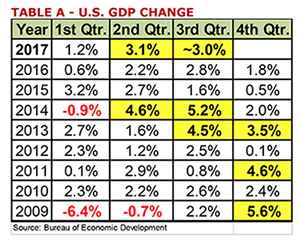 These quarterly GDP changes between 2009 and 2017 can be viewed in Table A. Highlighted in yellow are the quarters that GDP was 3% or higher. Historically, we have not seen two back-to-back quarterly GDP increases of 3% or more since Q2 and Q3 2014. 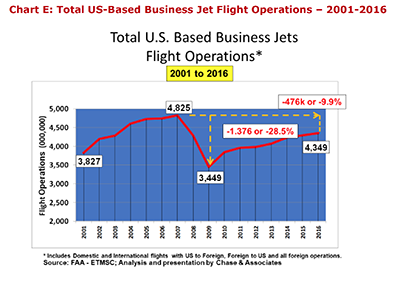 Chart A illustrates that the ‘For Sale’ inventory of Business Jets has decreased steadily from a high-point in July 2009 (2,938) to 2,225 jets in September 2017. That’s a reduction in the percentage of the in-service fleet from 17.7% in July 2009 to 10.4% now. This is a positive sign as the inventory ‘For Sale’ is dropping, albeit slowly. Today’s market remains good for buyers because the aircraft ‘For Sale’ inventory remains over 10%. 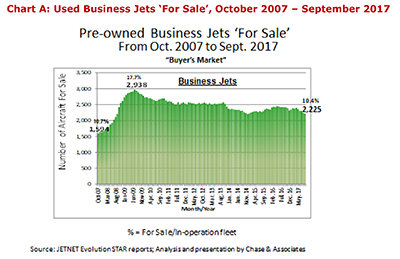 If jet owners are retaining their business jets longer since the downturn began in 2008, perhaps that would help explain why the used business jets ‘For Sale’ inventory has remained at such high levels since the Great Recession. The percentage ‘For Sale’ has dropped from 11.0% in January 2017 to 10.4% at the end of September 2017. Indeed, most aircraft business jet dealers and brokers today would tell you that the pristine used jets that were on the market a few years ago have become more challenging to locate. Further analysis of January-September 2017 shows mixed results for the six segments reported by JETNET in the September 2017 YTD Market Information release that included full sale transactions increase for business jets (5.9%), turbine helicopters (5.7%) and Commercial Airliners (8.8%) in YTD numbers (YTD September 2017 versus YTD September 2016). The remaining three segments reported double-digit decreases in transactions with piston helicopters (-14.1%) showing the largest drop in YTD 2017 vs 2016. 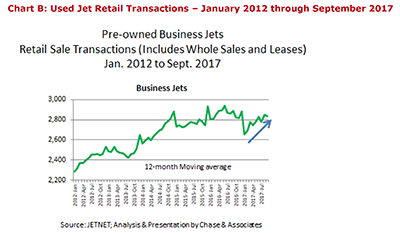 Charts B & C depict the 12-Month used business jet and turbine helicopter moving average, displayed for the full retail transactions from January 2012 to September 2017. From January 2012, used business jet transactions steadily increased until 2014—from 2,300 to over 2,800. A leveling-off followed in 2015, and 2016 produced mixed activity (while remaining well above the 2,800 line of transactions). Since dropping to 2,652 transactions in January 2017 the used business jet market segment has shown a sharp recovery through September 2017 (2,833). This could be a result of built-up demand in the US after the newly-elected government administration finds its footing and the stock market continues to climb to record highs. 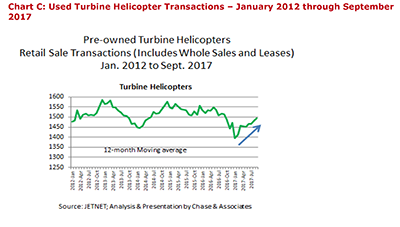 Since reaching a low point in January 2017, the used turbine helicopter market segment has shown a very rapid recovery leading into September 2017 (see Chart C). This is great news, and could indicate better days ahead for the turbine helicopter market. 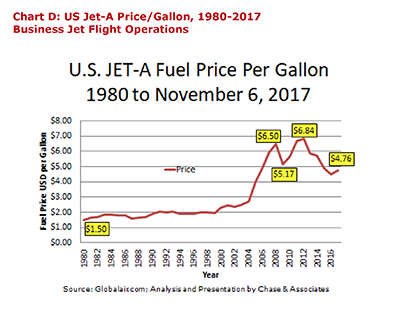 As of November 6, 2017, US Jet-A average price was $4.76/gallon and appeared to be on the rise. This fuel cost increase could have a negative impact on some of the progress we have been making in business aircraft flight activity. Nevertheless, today’s price is still around $2.00 less than the 2012 record fuel price of $6.84/gallon, as shown in Chart D.
The past 12 months of flight operations from September 2017 have been running 2.3% ahead of last year. Flight operations have not reached the peak of 2007 yet, but the trend is a positive sign nonetheless. Historically, the fourth quarter of the year reflects the most sales growth over the other quarters. We expect to see further growth in Q4 2017 to round out a very good year for used business jets and turbine helicopters. ‘For Sale’ inventories are slowly coming down and sales transactions continue to trend in a positive direction. We keep our fingers crossed and will continue to monitor business aircraft activity through future articles. Being married to an engineer has opened my mind to a whole new world. People have often speculated where aviation seems to be going and spoken praises for the engineers who have built modern aviation and contributed to the technology boom, but outside of the circle of engineers and tech people, little thought is given to the tools that fuel modern engineering innovation. It’s interesting that above my husband’s desk, hanging on the wall next to his computer monitor is a framed original 1929 engineering drawing of a Waco Biplane. He keeps it there as a reminder of how far we have come in the span of a lifetime while he draws the same biplane in a 3-dimensional computer aided design software called Solidworks. Up until the late 80s most engineering drawings were made by hand. SolidWorks is one of the most popular programs today that allows one engineer to design something in a few hours what would have taken a dedicated team of engineers and draftsmen weeks in the past. Drawing in two dimensions is simple and gets the job done, but as designs become more and more complex, two-dimensional drawings become more and more prone to error. 3D CAD, on the other hand, eliminates errors before they begin by recognizing dimensional conflicts such as over and under defining parts and can generate two-dimensional drawings in a matter of seconds. These programs dramatically boost productivity and eliminate errors, allowing engineers to design more things faster and more accurately. Beginning of the right-lower wing of the Waco in 3D CAD. Adjustments already had to made to get the metal brace clips to line up properly. With the models like the one shown above, engineers can ask the software to check for dimensions that don’t work out and other minor complications that were not thought of. Furthermore, one can ask the software how much the assembly weighs, what the properties are under specific loads and adjust for these shortcomings. Another fascinating tool that today’s engineers are using is 3D scanning technology. There is a company called Aircorps Aviation that we met at Oshkosh 2017 that uses handheld laser scanning technology to scan aircraft parts to reverse engineer and 3D model. This is extremely useful for aircraft restoration project that deal with parts that are no longer available or difficult to find. Being able to recreate the part by seeing what other parts are around it is ingenious and will help restoration projects that may not have been possible otherwise. The crazy thing is that with all these technological innovations, engineers are not getting dumber. They are still incredibly brilliant people, but 3D CAD helps them push the line between reality and the impossible, making today the world of tomorrow. Whatever aviation innovations may present themselves in the next few years, these tools are helping make them the most that they can possibly be.